3. Create a new view of content and add a display of a Feed. Set the format to GeoJSON Feed and add in your fields for title, latitiude, longitude & description. 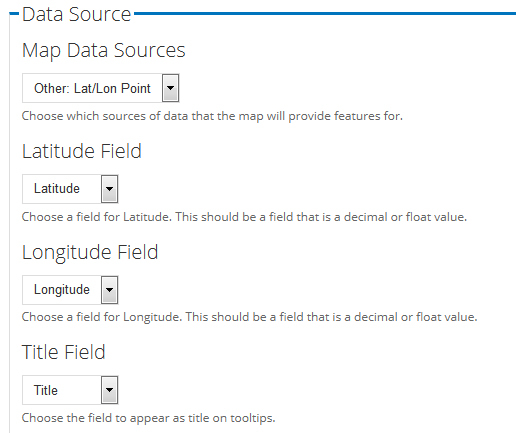 Under Format settings, map the Fields to the Data Sources. Make sure the display style for latitude and longitude is set to ‘Decimal Degrees’. Add a new layer, give it a suitable title and click continue. Set the layer type to be Vector and choose the source to be the views feed that you just created. Continue with the defaults until you have a completed layer. 5. Go to the maps tab and add a new map. Give it a suitable name and click continue. On the map settings page you can set the maps default position, zoom & expose it as a block. 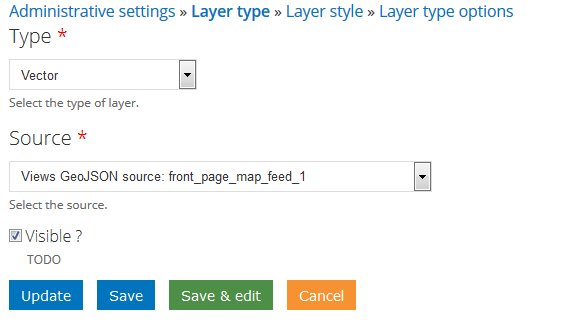 (If the map doesn’t appear you most likely haven’t installed the Openlayers library in the sites/all/libraries folder). On Layers and Sources you need to select your data layer plus a mapping layer, in this case I’m using Google Maps: The data layer is the one we created above. The next tab allows you to add controls such as Zoom and Full Screen. Interactions allows dragging, mouse wheel zoom etc. Components allows additional options such as popups – for instance someone can click on a popup to see the title and description (that we added in the view). Finally the Preview tab will show you the map with the markers – if it doesn’t, check all of the settings on the previous tabs as well as the preview of the GeoJSON in the View. If you get stuck at any point check some of the examples in both Openlayers & Views and compare the settings/outputs against what you have. 6. 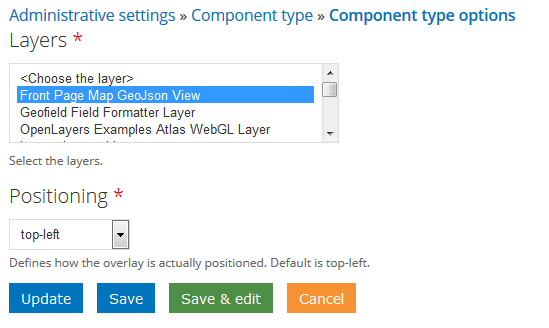 To get the popup to work you will need to go back to Structure > Openlayers and click on Components. Add the component as a popup, select the layer as the view you created. You can then edit the components section of your Map and select this Popup. 7. Finally go to blocks and move the map block onto the region that you want it to show. If the map doesn’t show as it didn’t for me set a height to the content class within the block e.g. This should be everything you need to get Location + Views + Openlayers working in Drupal 7x. For those interested IP Geolocation Views and Maps is worth a look too, if you are interested in Openlayers and other map providers too. Nice, I wondered about this. Did you also try some styling? Not on this one but the process doesn’t look too different from the previous version. I can’t use for filter items. Any trick to do it? Thanks for the tutorial, very helpful. I have been searching for a way to add a contextual filter to the geojson feed, but cannot find a solution. I saw you asking about this in a Drupal.org issue queue, did you ever find a way to make it work? Thanks. Unfortunately not and the problem is that OpenLayers has moved on further and has become increasingly frustrating to work with. I try to do more simplistic maps just using the GMap module now.